Packed with the essentials you want, the 2010 model Horizon T103 treadmill is a smart way to get your exercise while saving hundreds of dollars over more expensive treadmills. 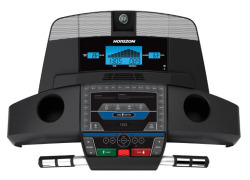 On the console, the Horizon T103 treadmill features a blue backlit LCD window with readouts for time, speed, distance, pulse, calories burned, and more. It has an Advanced Goal Center™ with programs, from which you can choose Target workouts (time, distance, or calories), Terrain (Intervals, Hills, Weight Loss, and Manual), Custom, or a 1-to-30 day tracking program. 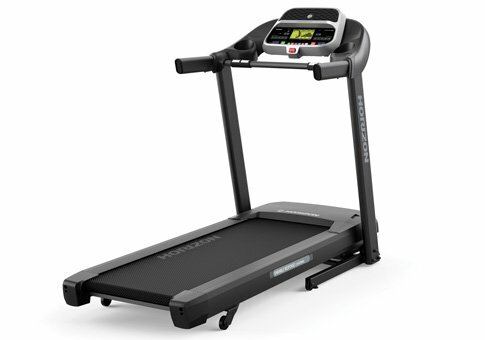 Wt / Dimensions: 202 lbs / 70.2" x 33.3" x 58.1"
UPDATE: The Horizon T103 treadmill has been discontinued. Take a look at the latest available models to find a comparable model. The Horizon T103 treadmill has solid power in its Johnson-Tech 2.75 CHP motor, and features a standard walking area (20"x55"), and an advanced shock absorption system that lessens the impact on joints when running or walking. 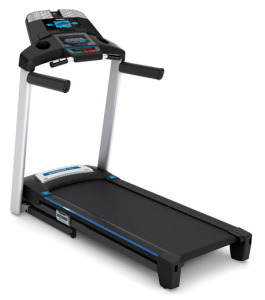 The Horizon T103 has a 1% - 12% power incline (adjusting in .5% increments), a durable 2-ply treadmill belt, iPod control buttons built right into the console, and two hydraulic shocks to assist you when raising and lowering the deck for storage. The extended 2-year parts warranty is also an appealing selling point. Treadmill reviews report that the assembly on the Horizon T103 is straightforward and should not pose any problems. It is a much sturdier treadmill than you might imagine, even for larger people weighing up to 350 pounds. Another feature that comes as a pleasant surprise is that the belt movement is whisper quiet so there’s no need to turn up the TV to hear your show, or need to stay off the treadmill while your child sleeps. There has been a slew of $1500 treadmills have been suddenly discounted to under $1000 in 2010 to compete for customers in this tough economy. The clear winner is the consumer who is now able to buy a much better machine at an unbelievably low price than was possible two years ago. At $999, the Horizon T103 reflects the new reality in mid-priced treadmills. Horizon has found the sweet spot in keeping the retail price low, yet they are maintaining quality by installing thicker plastic parts, better cushioning, and by including a good (but not excessive) number of workout programs. Competing along side the solid ProForm Power 990, the impressive Nordictrack T7 si, or the all new Livestrong LS9.9T treadmill — which sport beefy 2.75 CHP or better motors and 325-lb user capacities — the Horizon T103 treadmill has helped to set the bar higher for machines priced at $999.